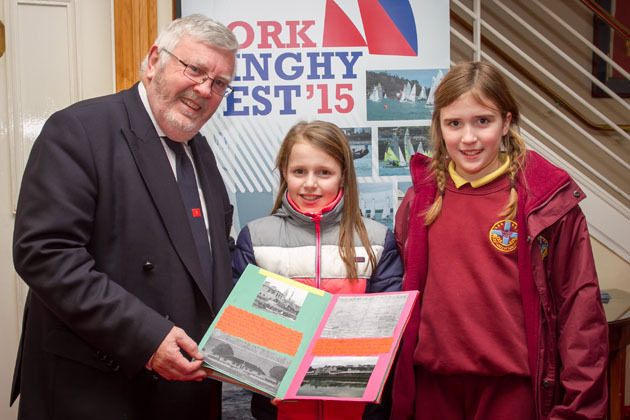 Two ten year old schoolgirls Eva Spillane and Zara Casey from Our Lady of Lourdes School, Ballinlough Cork, have compiled a magnificent entry for the Cork Schools History Project and selected the Royal Cork Yacht Club as their subject. They are both from Mrs. O’Connell’s fourth class. They happened to be present at the club on Monday evening last when the members were arriving in large numbers for the Annual General Meeting and were more than happy to display their work to the many interested members and met with Admiral Pat Lyons and the Executive Officers. They also met with a very large number of former Admirals and officers as well as the general attendance of members. All were greatly impressed with their work and congratulated the girls with many fine tributes and written comments. The RCYC project is a magnificent collection of details of the club going right back to the foundation. They have spared no effort in compiling the information and pictures and were very appreciative of the help they had received from the Club Historian, Dermot Burns when they “interviewed” him and also spoke very highly of the help they had received from Club Steward Anne Lordan. The work was beautifully presented and so well thought out in its presentation. The written pages were in beautiful handwriting and the work contained so many historical facts it would leave one breathless and perhaps even surprised at some of the history members might not have been aware of. We wish Eva and Zara every success with their wonderful entry for the Cork Schools History Project. The Annual General Meeting of the Royal Cork Yacht Club took place on Monday, January 19th with large numbers in attendance.